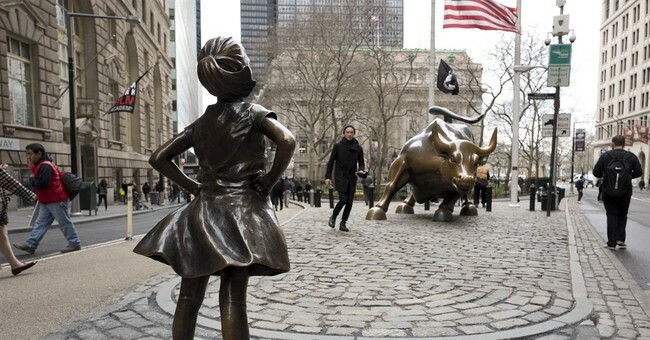 In honor of International Women’s Day, State Street’s Global Advisors have temporarily installed the statue of a young girl, opposite the iconic Wall Street bull in Manhattan. According to the firm, the statue was meant to serve as an appeal to encourage State Street’s clients to hire more women on their corporate boards. As a former analyst of a financial institution on Wall Street, I found Ms. Visbal’s suggestion somewhat odd. I had never envisioned that my status as a woman meant the Wall Street Bull was incapable of representing me—that I needed a separate statue, and a young, prepubescent girl, at that. I recall my first week as a bond rater, when my firm took my hiring class on a historic trek through Wall Street. The organized endeavor was part of a larger effort not only to foster relationships within the hiring class but also to cultivate an appreciation for the magical enigma that is Wall Street. At the conclusion of the outing, when we all posed for a photo next to the iconic bull, it never occurred to me that the spirit of Wall Street—embodied by the bull—was decidedly not for me. When first installed at Bowling Green in 1915, the choice of a bull was a deliberate nod to the term “bull market,” a market in which investors are optimistic and returns are strong. Italian artist Arturo Di Modica first conceived the bull in search of a way to capture the sprit of New York City, which he felt offered the prospect of success to anyone willing to work hard, irrespective of country of origin or creed. Whereas the bull was and is representative of the scrappy attitude that unites those on Wall Street, the young girl is a reminder of what divides us—gender. However, if we women envision ourselves as integral to the fabric of the Wall Street community, positing ourselves as resistant to its very icon seems pointedly strange. Should the female statue not be standing beside the bull? Or the better question might be, have we traversed so far down the path of identity politics that we no longer find strength in identifying universal values but rather, in identifying demographic differences? The Fearless Girl statue brings up a fundamental question circulating in politics today—do we unite people by discovering and relishing shared experiences and beliefs or do we single out groups of people in an attempt to celebrate individual characteristics belonging to some but not all? Better yet, is there a way to do both? There is, but I don’t believe the particulars of this statue—with its positioning, posture, and juvenile stature—achieve the desired result. I looked at the Charging Bull with pride from my office, as emblematic of the plucky and determined culture I had come to embrace. I reject the notion that, in erecting a statue of a female in Wall Street, I am supposed to feel more “welcome” on turf I already call my own. The precise opposite is achieved. I am reminded that Wall Street is a spectacular space—and I am a perceived foreigner within it.